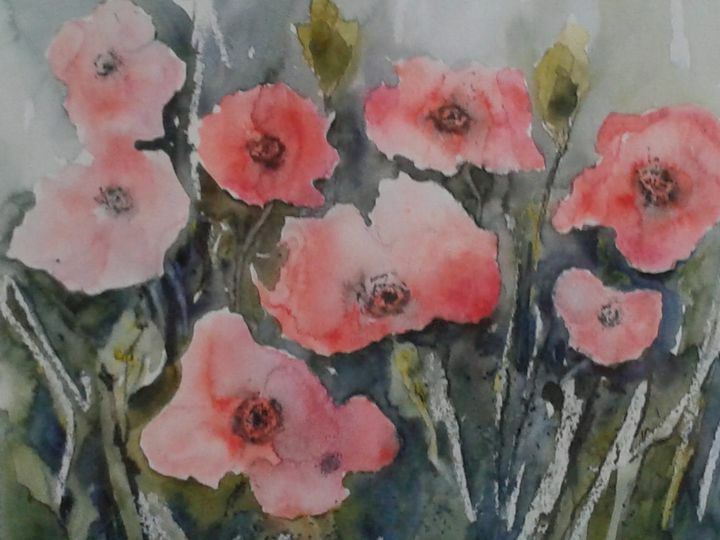 "Summer Blooms" is an original water colour painting (29,5cmx27,5cm), one of the first paintings to be put on sale since the death of the artist in 2017. 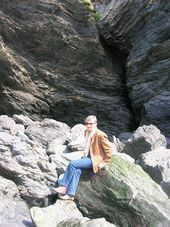 Cynthia spent much time in her garden in Llechryd near to Cardigan in South Wales. It was there that she turned her garden house into to her studio. Cynthia Anne Ross, born Atkinson-Holmes, was born in Bedfordshire in 1930 where she grew up and witnessed the Second World War. Later, while training as a nurse in Jersey, she met, fell in love with and married Doctor Charles Frederick Ross, the man that she would share her life with all the time that he lived. It was during this period that Cynthia moved to Wales. Here, after the death of Frederick, she took to painting the much loved land and seascapes around her home in Llechryd, South Wales, UK. She passed away at home surrounded by family in 2017. You can see more of Cynthia's work by searching on facebook Cynthia.Anne.Ross@artistinWales. One of Cynthia's last paintings, "Red Sky at Night ..." has been put into the Fishguard Arts Society's 2018 Summer Exhibition ( http://www.fishguardartssociety.org.uk/ ). These paintings are the first to be sold following the death of the artist.